After extensive testing with a grocery fleet in California, a nitrogen trailer cooling system is available that offers an alternative to traditional diesel-powered refrigeration systems. Boreas Nitrogen Cooling Systems highlighted its new dual-zone system at last week's TMC annual meeting in Nashville, saying it offers greater temperature control and costs less to operate. The is plumbed to flow liquid nitrogen to the spray nozzles in the cargo space of the trailer. Once the liquid nitrogen hits the (relatively) warmer air of the trailer, it is turned into a cold gas. Because this creates a low-oxygen environment, the systems use sophisticated sensors, electronics and safety controls to protect drivers, dock workers and others. This also, however, means the system is best suited to operations where the doors are not being opened frequently. The Boreas system allows users to set two separate temperature conditions within the same truck. The dimensions of the temperature zones can be changed through an adjustable bulkhead position. 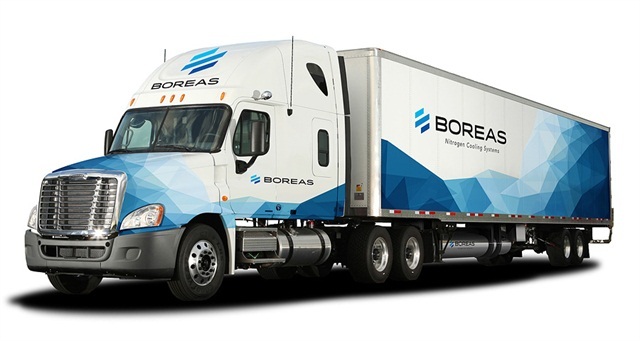 Unlike traditional reefer trailers which can be warmer in the back of the trailer away from the refrigeration unit, Boreas says its system provides more consistent temperature control throughout the trailer. The Boreas System also presents significant environmental benefits, according to the company, operating only when cooling cargo and generating zero carbon emissions. Additionally, the system is virtually silent, making it attractive to operators traveling in residential areas. The system also is virtually maintenance-free, according to the company. For additional information visit www.boreassystems.com.